The 90,000 cars and trucks that daily travel along a 3.7-mi. 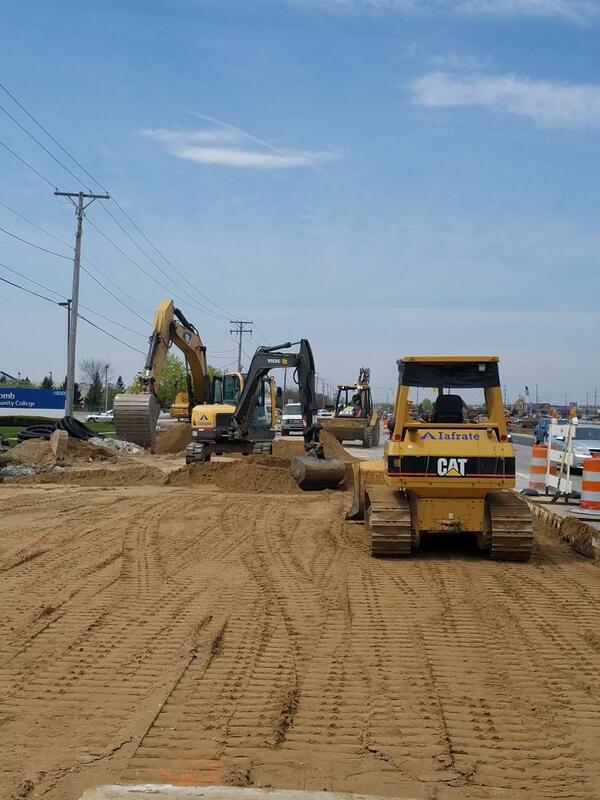 stretch of M-59/Hall Road between M-53 and Romeo Plank are the biggest challenge for the crews of Angelo Iafrate Construction as they work to complete the $60 million rebuilding of the highway. The work, along the “Golden Corridor,” began in March 2016 and is expected to be completed September 19, 2018. 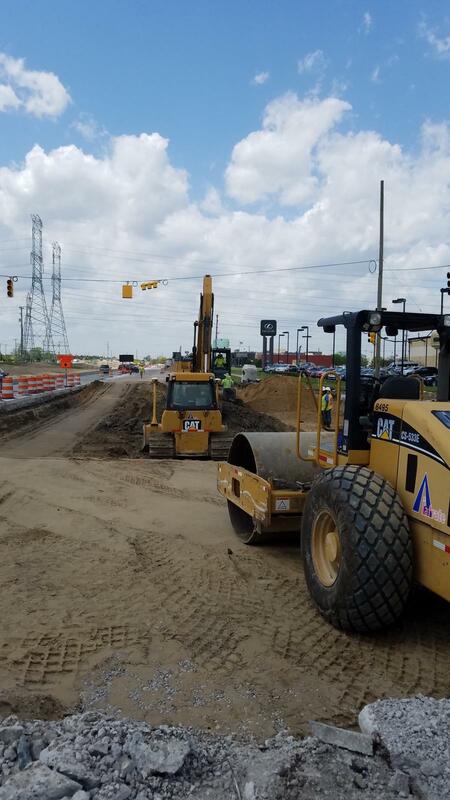 This year's construction season focuses on the rebuilding of M-59 between M-53/Delco Boulevard to just west of Garfield Road. The 2018 work covers the area from Garfield to Romeo Plank. The east-west concrete road, four lanes in each direction, will retain its lane configuration when completed, but traffic flow will be improved and it will be converted into a traditional asphalt-based road surface. The construction is seeing crews working mainly day shifts, with some night work, not only rebuilding the road, but also upgrading ramps, repairing and adding sidewalks, improving drainage with a new storm water sewer, replacing signs and traffic signals, and enhancing the landscape. 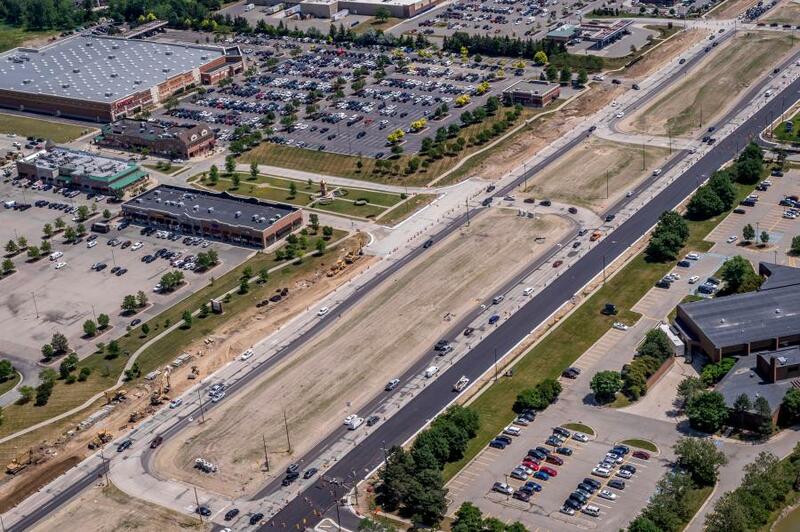 The construction is taking place in the communities of Sterling Heights, Utica, Clinton, Macomb and Shelby townships. M-59 began its life on July 1, 1919 and is now “one of Michigan's most heavily travelled roads.” The trunkline highway crosses the northern part of Metropolitan Detroit between Howell at I-96 and I-94 on the Chesterfield–Harrison Township line, near Selfridge Air National Guard Base in Macomb County. The concrete roadway being replaced was built 22 years ago. Despite the construction, all the businesses in the corridor will remain accessible and pedestrian access is being maintained. “Three lanes are open in each direction from M-53/Delco Blvd. to Romeo Plank every day, between 6 a.m. to 9 p.m., including weekends, and usually two lanes from 9 p.m. to 6 a.m, unless heavy equipment needs room and requires road to briefly have only one lane open,” said Cross. The work on the eastbound M-59 bridge over M-53 is completed and currently has three lanes open as traffic merges into the workzone east of M-53. Westbound M-59 over M-53 will have all four lanes open, including the ramp to southbound M-53. Tetra Tech designed the new road infrastructure, with an emphasis on a roadway that can better withstand the impact of truck traffic. Greg Hooper, Angelo Iafrate's senior project manager, P.E., said the rebuilding of the 2.5 mi. section between M-53 and Garfield took place in March. Night work is being scheduled for several elements of the project, which includes the M-59 overpass over M-53. “This involves patching portions of the road and repairing the bridge deck substructure,” said Hooper, whose crews are now removing the existing concrete pavement and will be recycling it into MDOT 4G aggregate to be re-used on the project. The materials being removed include 100,000 cu. yds. of concrete and 445,000 cu. yds. of earthwork. The new road will have an 8-in. Class II sand sub-base with several lines of edge drain, that will be covered with 16 in. of MDOT 4G aggregate and topped with 7.5 inches of new asphalt. New materials for the project include 164,250 tons of asphalt, 15,000 cu. yds. of concrete, 1,000 tons of steel/rebar, 425,000 tons of aggregate and 120,000 tons of sand. The three phase project has three superintendents — Joe Wright, Rich Green and Todd Wicks. On peak days there will be an average of 100 Angelo Iafrate and subcontractor employees on site. There are 27 subcontractors working on the project, with the major ones being Cadillac Asphalt for the asphalt paving, Rauhorn Electric for electrical and traffic signal work, Poco Barricades for temporary traffic control, Z Contractors for the bridge work and PK Contracting for pavement marking. In addition to weekly meetings with MDOT and daily interactions at the job site, Hooper and his team coordinate benchmarks with the subcontractors. Utility issues also are a major challenge, and they involve numerous gas, electric and water lines that service all the businesses along M-59. Work on M-59 will be suspended from late October to March, which gives additional time to plan the final stage of the project. Angelo Iafrate will employ more than 50 vehicles and pieces of equipment on the project, which will have an onsite mechanic to ensure that repairs can be done quickly. Other equipment includes: Cat, 365, 345, 336, 325, 315, 312 307 excavators and Volvo, EC 380, EC 220 ECR 88 excavators; Cat 40H and 140M graders; Cat, 563 and CS533 rollers and Hamm, HD13VIOs rollers; Cat 972, 962, 950 and 938 loaders; and Cat, D6N, D6K, D5K and D5Gs dozers. Our mechanics working on site are Brian Flynn and Danny Baltierra, who have a combined 30 plus years experience with Angelo Iafrate. Assisting Flynn and Baltierra, are several lubrication mechanics that service the equipment at night or early in the morning. Foster Blue Water makes daily fuel deliveries. 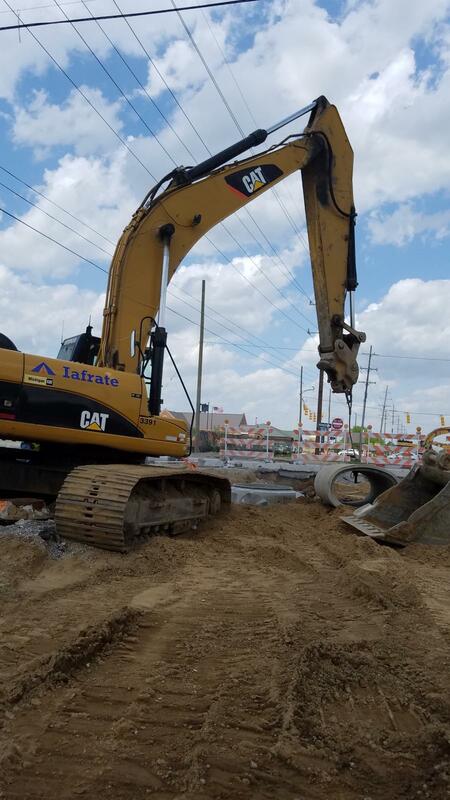 Angelo Iafrate purchases equipment and vehicles from Michigan CAT in Shelby Township — about three miles north of the project, as well as AIS Equipment in Richmond and ALTA Equipment in New Hudson. “All of these vendors are key in supporting our equipment availability and efficiency,” said Hooper. Hooper noted that planning for the project was extensive and that the schedule and game plan is constantly updated to factor in the field changes which gives the general contractor the ability to maximize work progress.